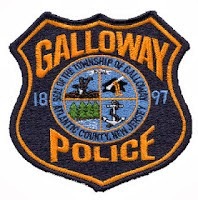 Galloway Township Police responded to 880 calls for service during March 30, 2014 through April 5, 2014. Additional statistics include: 3 Burglaries, 22 Motor Vehicle Accidents, 70 Tickets issued, 2 Driving While Intoxicated, 17 Arrests, 15 Domestic Violence,15 Fire Calls, 65 EMS Calls and 3 Juvenile calls. Tyler D Greenway, 20 of Manahawkin, was arrested for DWI by Ofc Welsh on March 30. Timothy V Laipsker, 26 of Livingston, was arrested for Possession of less than 50 grams of marijuana by Ofc Kline on March 31. Paul R Bell, 27 of Atlantic City, was arrested for Hindering Apprehension by Ofc Kline on April 1. Stephanie G Thomas, 43 of Pleasantville, was arrested for Hindering Apprehension by Ofc Costa on April 2. Renee L Rutherford, 42 of Millville, was arrested for (2) counts of Theft of Movable Property and Possession of CDS by Ofc Kline April 5. A 17 y/o male of Galloway was charged with Possession of less than 50 grams of marijuana and Possession of drug paraphernalia on April 3 by Ofc Crocker. A 16 y/o male of Galloway was charged with Possession of less than 50 grams of marijuana on April 3th by Ofc Crocker. A 16 y/o male of Galloway was charged with Possession of CDS on School Property, Manufacturing/Distribution of CDS,and Possession of less than 50 grams of Marijuana on April 3 by Ofc Crocker.